Road repairs on the A3 southbound exit slip to the A245, entry slip from the A244 and between the A309 and the junction with the M25, are set to continue tonight. It will see all lanes closed from 10pm until 5.30am. Emergency barrier repairs are planned on the M20 westbound between 10.30pm tonight and 5am tomorrow. This will see, between junction two and junction one, lanes two and three closed. At junction one, lane two will be closed and eastbound, between junction one and three, lanes two and three will be closed. One the M25, anticlockwise between junctions one'a' and 31, lanes three and four will be closed. due to emergency roadworks from 10pm tonight until 5am tomorrow (Monday). All lanes of the M3, east and west bound, are set for lane closures from 9pm tonight until 6am tomorrow. This will impact between the M27 eastbound and junction 14 and westbound between junctions junction five and three for road repairs. 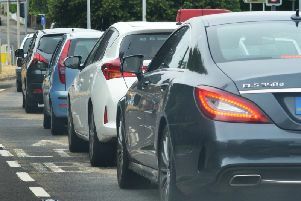 Motorists have been warned to expect disruption everyday this week between 10pm and 5am on the A21 southbound exit and entry slip to/from the A25 east due to emergency barrier repairs.